Kuala Lumpur – Malaysian and international human rights organizations are uniting to publicly denounce the actions taken by police to intimidate indigenous peoples in Sarawak at the proposed site of the Baram Dam. 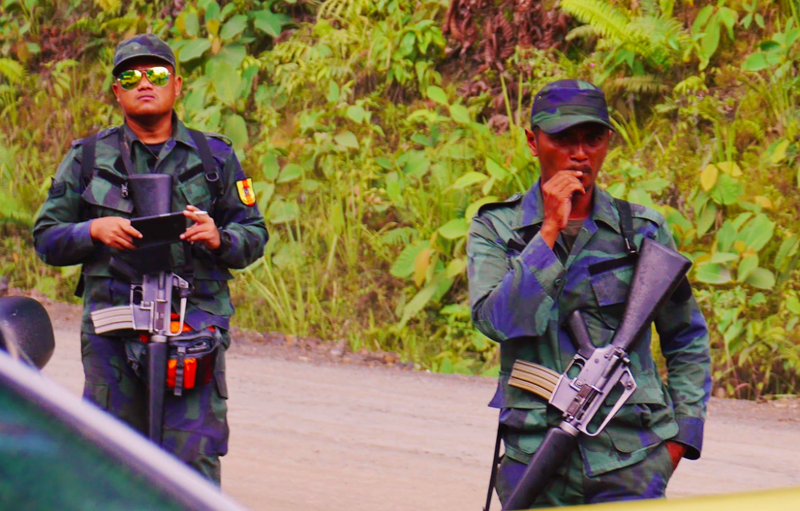 On 31 October, when a group of residents from the villages of Long Na’ah and Long Kesseh tried to access customary lands located within the site designated for the proposed Baram Dam, they were blocked by over 30 police from the General Operation Force and at least 10 enforcement officers of the Sarawak Forestry Corporation. As of Tuesday, 4 November, the General Operation Force (GOF) and Sarawak Forestry Corporation (SAPU) personnel remained encamped at the area, acting as an intimidating presence to the people of Long Na’ah and Long Kesseh. If the 1200MW Baram Hydroelectric Project is built as proposed by Sarawak Energy Berhad (SEB), it will inundate 26 villages, flooding 400 square kilometers of land and displacing between 6000 to 20,000 people. The members of longhouses to be affected by the Baram Dam, including the people who live in the vicinity of the proposed reservoir, have never given consent for any timber clearance or other preparatory project works to proceed on their customary lands. Nevertheless, it appears that logging company M.M. Golden Sdn. Bhd, a subsidiary of Autorich Bhd., is seeking to proceed with extracting timber from the area, an act which is presumed to be in connection to reservoir clearance for the Baram Dam. GOF and SAPU personnel, along with representatives of the logging company, M.M. Golden Sdn. Bhd., have set up a camp in the area since 27 October. The police and SAPU have now established a makeshift gate at the site of the proposed dam, blocking indigenous people from accessing customary lands. In doing so, they appear to be backing the claims of M.M. Golden to the site. Human rights groups across Malaysia and internationally are therefore questioning why the police and forestry officials are prioritizing collaboration with M.M. Golden above upholding the rights of indigenous land owners. “The residents of Baram are seeking to protect the collective heritage of all Sarawakians; to keep the forests and rivers intact for future generations. Yet, the result is that they are now being subjected to intense surveillance and intimidation,” explained Thomas Jalong, president of Jaringan Orang Asal SeMalaysia (JOAS), who is also a resident of Baram. “It is time that the police order logging interests, including M.M. Golden, along with the proponent of the Baram Dam, Sarawak Energy Berhad (SEB), to withdraw from the area immediately. The land now surrounded by police is native customary land which has never been surrendered, and should therefore not be encroached upon. Rather than intimidating people and backing the interests of logging and power companies, the police have an obligation to act in accordance with national and international law. The families who reside on native customary lands must be allowed to live on their own properties without having to live in fear of intimidation at the hands of the police and a few powerful individuals,” explained Tanya Lee of International Rivers. As a result of the escalating human rights concerns at the proposed site of the Baram Dam, local, regional and international groups, including SUARAM, JOAS, SAVE Rivers, International Rivers, Asia Indigenous Peoples Pact (AIPP), and Bruno Manser Fund will be following up with the Human Rights Commission of Malaysia (SUHAKAM) and the UN Special Rapporteur on the Rights of Indigenous Peoples.